I just got an email this morning from someone I follow Kevin Rose. And I wanted to shine light on the quality mantra he is embodying. Kevin does a monthly newsletter sharing cool stuff called The Journal. Now he made a promise early on to cut out those that weren’t reading. In doing so, he can figure out what his core audience is really in to and give them the best experience. It’s such a great example. Member update: We’ve lost some newsletter subscribers. We dropped from 61,823 members to 55,787. 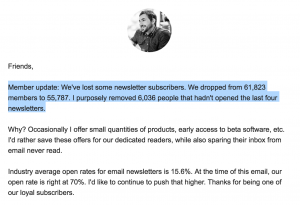 I purposely removed 6,036 people that hadn’t opened the last four newsletters. Now the data he is getting and the feedback is only from those that are truly in to what he’s up to. Also it incentivises him to keep at the top of his game. This entry was posted on Tuesday, August 2nd, 2016 at 3:40 am.